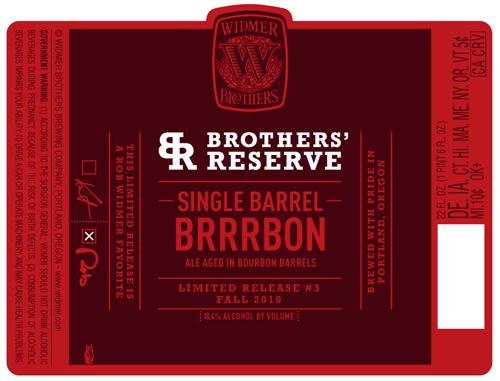 For this special release, we’ve taken our winter seasonal BRRR and aged it in Kentucky bourbon barrels. Hidden in the beautiful dark amber color are aromas of vanilla and caramel that complement perfectly the presence of bourbon. Soft oak flavors transition into a sweet yet slightly dry finish. After aging the ale for four months, the malt and hop complexity of BRRR melded harmoniously with the bourbon barrels and become a truly one of a kind beer. Brrrbon pours a dark heirloom tomato red with brown highlights. Head is two fingers of bubbly, foamy cream. Sediment is a plenty, with splashes of lacing hanging on for dear life. As one would expect from a beer this style, the nose is big and flavorful. Dark chocolate, cough syrup, faint black cherry and bourbon are the prominent scents. Add in molasses, ginger root and nutmeg to round things out. Essentially the nose of this beer could be summed up as “chocolate covered cherries soaked in bourbon”. I was initially surprised by how light and creamy this beer is. Spices come through first, with nutmeg and faint molasses being the most prominent. Bourbon arrives in the middle and rides it out until the end. There is a woodiness in the backend that made me think of chocolate ice cream covered popsicle sticks. Mouthfeel is drying and kind sticky. There is an egg yolk like creaminess in the backend that allows the beer to run down your gullet like water down a drain. Brrrbon is a very approachable barrel-aged beer. The bourbon is not over the top and doesn’t overpower the other flavors in either the nose or taste. Sadly the mint that I enjoyed so much in the regular Brrr isn’t present in Brrrbon, but that’s definitely not a deal breaker. A rather tame, but good, Winter Warmer, especially considering it’s bourbon based background.